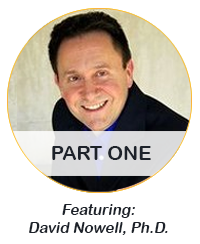 Become a leader in helping clients with ADHD overcome their emotional, behavioral, relationship and achievement challenges and thrive in life! Scientific advances have improved our understanding of the neuroscience of ADHD and have led to the development of effective, evidence-based strategies that are transforming the outcomes of the children, adolescents and adults who live with the diagnosis. Now with this new, comprehensive certificate training, you can elevate your practice with state-of-the art advancements for working with the unique brain wiring of ADHD clients and master proven strategies that will improve functioning and reduce the stress, shame, and anxiety of the disorder. Join our world-leading faculty of ADHD experts for a step-by-step clinical training that will revolutionize your ADHD treatment strategy, using both medication and non-medication approaches, and equip your child and adult clients with the skills they need to get motivated, focused, organized, and performing closer to their true potential. You’ll end this course with your Certificate in Evidence-Based Strategies for Managing ADHD Across the Lifespan! Earn up to 30 CE Hours — included in the course tuition! become an ADHD Certified Clinical Services Provider (ADHD-CCSP). Today's ADHD treatment advances have led to the development of evidence-based strategies to diagnose, manage and coach ADHD clients to help them improve executive functioning and self-regulation. 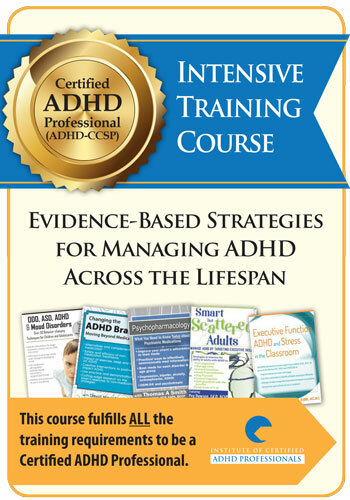 In this intensive certificate training program, you'll get access to comprehensive, state-of-the-art clinical insight, real-life case studies, reproducible client-friendly worksheets, and step-by-step treatment strategies that will equip you with skills and tools to help clients with ADHD and their families. 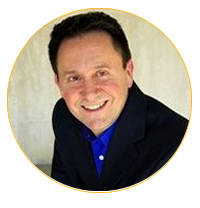 Join neuropsychologist and ADHD expert David Nowell, Ph.D., for foundational insight on the neuroscience of the ADHD brain that will prepare you to develop a holistic approach to working with adults and children with ADHD. Join ADHD expert and clinical scientist Dr. Russell Barkley to learn about a potential new disorder known in research as sluggish cognitive tempo (SCT) that overlaps with ADHD and may impact your treatment strategy. Get exclusive into the nature of ADHD symptoms and the current DSM5 diagnostic criteria for ADHD for specific client populations. Are you ready to step into the life awaiting you as an ADHD Certified Clinical Services Provider (ADHD-CCSP)? This course fulfills the educational requirements to becoming an ADHD Certified Clinical Services Provider (ADHD-CCSP) through the Institute of Certified ADHD Professionals. The Institute of Certified ADHD Professionals and their ADHD-CCSP Certification are endorsed by the Children and Adults with Attention-Deficit/Hyperactivity Disorder (CHADD) organization. Get Certified and Go Further... Become an ADHD Certified Clinical Services Provider (ADHD-CCSP) and show your employer, clients, potential clients and fellow professionals your commitment to honing your skills and staying up to date on ADHD treatment best-practices. As a Certified ADHD Services Provider, you will be invited to enjoy a one-year place in their Resource Directory (viewed by more than 4,000 people per month) and free membership with CHADD! 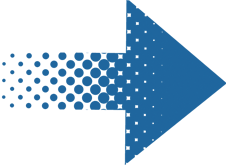 Don’t miss out on the benefits of letting others know of your Professional Certification and of being a part of the CHADD community through membership. By: Russell A. Barkley, Ph.D.
Dr. Russell Barkley, internationally respected expert on ADHD, draws on his 40 years of clinical work with thousands of students, teachers and schools to create a definitive resource for the most effective methods in overcoming impairments for children and teens with ADHD. 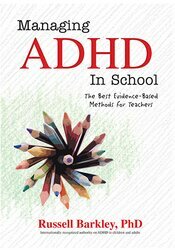 Managing ADHD in Schools details more than 100 evidence-based recommendations to help teachers and clinicians increase the success of children and teens with ADHD. This manual goes beyond the “what” to explain “why” the problems are likely occurring, followed up with the most effective interventions. Russell A. Barkley, Ph.D., is a Clinical Professor of Psychiatry at the Virginia Treatment Center for Children and Virginia Commonwealth University Medical Center, Richmond, VA. He is a Diplomate (board certified) in three specialties, Clinical Psychology (ABPP), Clinical Child and Adolescent Psychology, and Clinical Neuropsychology (ABCN, ABPP). 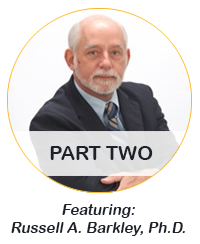 Dr. Barkley is a clinical scientist, educator, and practitioner who has published 23 books, rating scales, and clinical manuals numbering 41 editions. He has also published more than 270 scientific articles and book chapters related to the nature, assessment, and treatment of ADHD and related disorders. 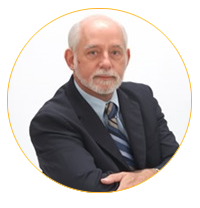 David Nowell, Ph.D., is a clinical neuropsychologist in private practice in Northborough, Massachusetts. He offers consultations to patients on an inpatient rehabilitation unit and is an adjunct instructor in neuropsychology to graduate students in the Clark University psychology program. He serves as a physician advisor with the University of Massachusetts Medical School Disability Evaluation Service where he was the former clinical director of the Learning Disability Assessment Program. Dr. Nowell writes a popular blog at Psychology Today on motivation and time management, and speaks internationally to clinicians on such topics as executive functioning, non-medication management of ADHD, and applying findings from Positive Psychology. 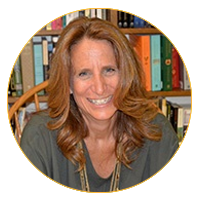 Cindy Goldrich, Ed.M., ACAC, is a mental health counselor, certified ADHD coach and teacher trainer. 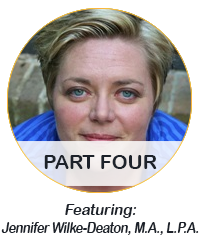 She is the author of 8 Keys for Parenting Children with ADHD, a book recognized for providing parents, educators, and therapists with a practical, easy-to-read guide for addressing challenging kids. She is the creator of the workshop series Calm and Connected: Parenting Children with ADHD© designed to teach parents and caregivers how to manage and support their children's unique needs successfully. Through her ADHD Parent Coach Academy, she trains other professionals to become ADHD parent coaches. 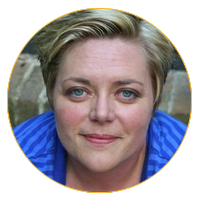 Jennifer Wilke-Deaton, M.A., L.P.A., is a licensed behavioral health therapist working in a private practice setting in Richmond, KY. Jen has more than 20 years of experience working with crisis management, psychological testing, inpatient/ outpatient treatment, groups, families, and the court system. A tireless and passionate advocate for children and families, she developed a parent training program recognized by the Governor’s Commission for the Treatment of Children &Families and Kentucky’s Child Protective Services. Jen helped create a regional children’s crisis stabilization unit, children’s advocacy center, and an intensive after-school program for behaviorally challenged youth. She has published the Creative Parenting Handbook, CD Awareness In Focus: Modern Guided Imagery Techniques for Immediate Practice, CD Awareness in Focus By Kids For Kids, and The Mandala Workbook: Activities Across the Lifespan. Peg Dawson, Ed.D., NCSP, is a school psychologist and has worked for 20+ years at the Center for Learning and Attention Disorders in Portsmouth, New Hampshire, where she specializes in the assessment of children and adults with learning and attention disorders. 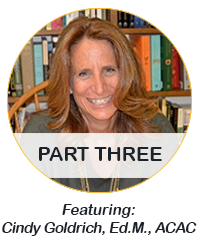 She is co-author of the best-selling books on executive dysfunction, Executive Skills in Children and Adolescents: 2nd Edition (Guilford, 2010), Smart but Scattered (Guilford, 2009) and Smart but Scattered Teens (Guilford, 2013). In her most recent book, the Smart but Scattered Guide to Success, Peg and her co-author take the same strategies that they have used with youth for many years, and apply them to an adult population. While the tactics and strategies are particularly suited for adults with ADHD, they are effective with any adults struggling with executive skill challenges. Click here for information about our Speakers . This certificate training has been specially created for professionals who work with ADHD, including Psychologists, Counselors, Social Workers, Case Managers, Marriage & Family Therapists, Nurses, Teachers/Educators, Speech-Language Pathologists, Occupational Therapists & Occupational Therapy Assistants and other Mental Health Professionals. The education provided in this intensive online training is designed to breathe new life into your clinical treatment plans for clients who are living with Attention Deficit/Hyperactivity Disorder (ADHD). Earning your certificate also meets the educational requirements to become a ADHD Certified Clinical Services Provider (ADHD-CCSP) through the Institute of Certified ADHD Professionals. 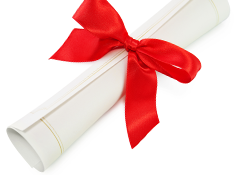 Learn more about certification here. Watch your email for your order confirmation, and get instant access to the comprehensive training plus the free bonus — all designed to help you effectively integrate proven treatment strategies for ADHD for children and adults into your practice. Instantly collaborate with other professionals on the course materials through interactive message boards. You'll be part of a community of hundreds of practitioners all focused on mastering ADHD treatment strategies, providing valuable opportunities to share insight and experiences and to build your professional network. Complete your online CE tests and earn up to 30 CE Hours! Click here for total course CE Credit and credit details specific to your profession. You'll end this intensive training with a course certificate of completion to apply towards ADHD certification!